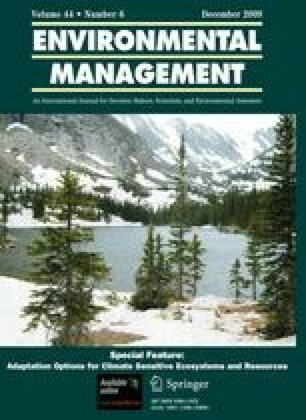 This study explores potential adaptation approaches in planning and management that the United States Forest Service might adopt to help achieve its goals and objectives in the face of climate change. Availability of information, vulnerability of ecological and socio-economic systems, and uncertainties associated with climate change, as well as the interacting non-climatic changes, influence selection of the adaptation approach. Resource assessments are opportunities to develop strategic information that could be used to identify and link adaptation strategies across planning levels. Within a National Forest, planning must incorporate the opportunity to identify vulnerabilities to climate change as well as incorporate approaches that allow management adjustments as the effects of climate change become apparent. The nature of environmental variability, the inevitability of novelty and surprise, and the range of management objectives and situations across the National Forest System implies that no single approach will fit all situations. A toolbox of management options would include practices focused on forestalling climate change effects by building resistance and resilience into current ecosystems, and on managing for change by enabling plants, animals, and ecosystems to adapt to climate change. Better and more widespread implementation of already known practices that reduce the impact of existing stressors represents an important “no regrets” strategy. These management opportunities will require agency consideration of its adaptive capacity, and ways to overcome potential barriers to these adaptation options. After Linda Joyce, the authors are listed alphabetically. We thank the US Climate Change Science Program and the Lead Authors of Science and Assessment Product 4.4, Susan Julius and Jordan West and the three anonymous reviewers. Support was provided by the US Forest Service, and for Blate, from the AAAS Science & Technology Policy Fellow Program, and the U.S. EPA.